If you really need to hit a target at a distance then you need a rifle. 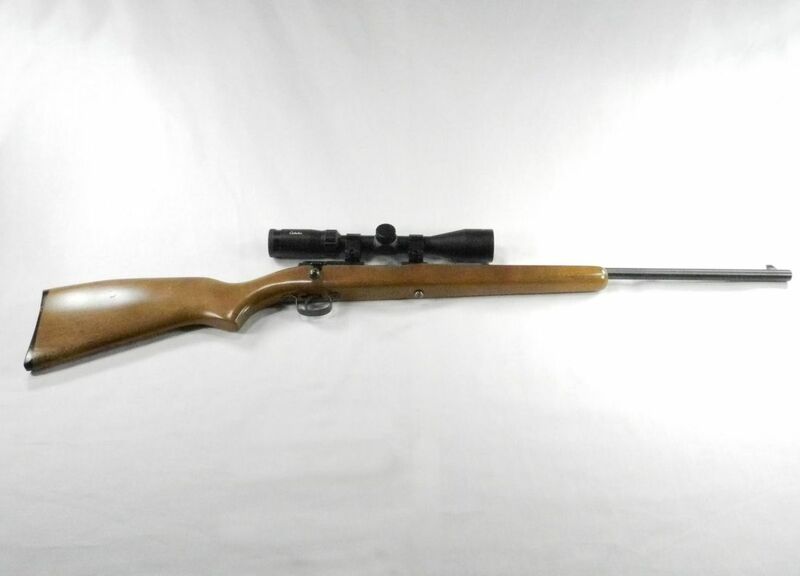 Just like I have some Hiking and Camping equipment that has been with me for a while, so has this .22 caliber rifle. It was the first rifle given to me by my parents when I was a kid working on my target shooting skills. The criteria that we use to evaluate small caliber single shot rifles are: 1) caliber 2) accuracy, 3) fun factor and 4) price. Even though I have had this gun for years I still shoot it often since hitting a small bulls-eye at 75 feet is always challenging. The fact that it is a single shot bolt action rifle really makes you concentrate on the mechanics of shooting since you can’t just pump round after round downrange. Since you will not be able to buy this rifle at your local FFL dealer, you will probably need to go to gunbroker.com to find a previously owned one that someone else is selling; or you could just buy one of today’s equivalent rifles and have fun with it instead. If you would like to see a detailed YouTube review of the Winchester Model 121 - Iraqveteran8888 has one of them doing some 220 yard distance shooting here. As a complete contrast to our Winchester Model 121 when we wanted to add a modern .22 caliber rifle to our collection we looked at AR-15 platforms. Given my background in the military this seemed like a logical conclusion since we already had other “black” rifles. The criteria that we use to evaluate small caliber multi-shot rifles are: 1) caliber, 2) accuracy, 3) reliability, 4) fun factor and 5) price. After looking at the .22 caliber options on the market we bought the Smith & Wesson M&P 15-22. This .22LR semi-automatic firearm has a blowback design and is made of polymer with a carbon steel barrel. The rifle measures 33.75" long and weighs approximately 5.57 lbs (unloaded). The barrel is 16" long and has a 1 in 15" twist. The front sight is a adjustable A2 post and the rear sight is an adjustable dual aperture. The sight radius is 15.5". The rifle has a stock that with 6 adjustable positions (for most States) or with a fixed position (for States with more onerous laws). The trigger pull is approximately 7 lbs. Magazines are available in both 10 and 25 round variants. We like this firearm because it feels like an AR, but is easy and cheap to shoot since it is a .22 caliber. You can buy this rifle at smith-wesson.com or your local FFL dealer. If you would like to see a detailed YouTube review of the Smith & Wesson M&P 15-22 - mixup98 has a good one here. Since we shoot at an indoor range quite a bit during the year one of the other rifles that we looked for was a pistol caliber AR-15. The criteria that we use to evaluate pistol caliber multi-shot rifles are: 1) caliber, 2) accuracy, 3) reliability, 4) fun factor and 5) price. Given our love for 9mm firearms we ended up purchasing a 9mm AR-15; the Stag Arms Model 9. This semi-automatic 9mm firearm has a blowback design, measures 32.5" (collapsed) or 35.75" (with the Mil-spec 6 position stock fully extended or pinned for legal reasons) and weighs 6.8 lbs. The upper receiver is made from forged mil-spec 7075 T6 aluminum with type 3 hard coat anodizing and has a Picatinny rail on top. The lower receiver is made from 7075 T6 aluminum with a type 3 hard coat anodizing. The 16" 1/10 rifled barrel is made from 4140 heavy profile steel that is chrome lined and manganese phosphate coated. The firearm has a 9mm bolt carrier with a manganese phosphate coating and a standard 9mm buffer. It has an A2 style plastic grip, a 9mm single stage AR-15 trigger (which can be upgraded), a Diamondhead VRS-T drop in modular handguard and a standard mil-spec charging handle. The front sight is a Picatinny railed gas block and there is no rear sight. Since this firearm uses magazines that are the same form factor as Colt 9mm magazines they are available in 10, 20 and 30 round variants. Given its size and weight this firearm feels just like our 5.56mm AR-15 – but shoots like a 9mm. It’s very accurate at reasonable distances (we normally shoot it at 60 yards or less) and lots of fun to shoot. One thing that we like about Stag Arms is that they offer other upgrades and customizations to their firearms (to include left-handed variants) – so you can really get the firearm that is best for you. In 2017 Stag Arms stopped making the 9mm Model-9 so you will probably need to go to gunbroker.com to find a previously owned one that someone else is selling. If you would like to see a detailed YouTube review of the Stag Arms Model 9 - Gun Talk Media has a good one here. The most serious rifle that we have in our collection is a 5.56mm/.223 caliber AR-15 since it fires the highest velocity rounds and has the most kick. The criteria that we use to evaluate large caliber multi-shot rifles are: 1) caliber, 2) accuracy, 3) reliability, and 4) price. 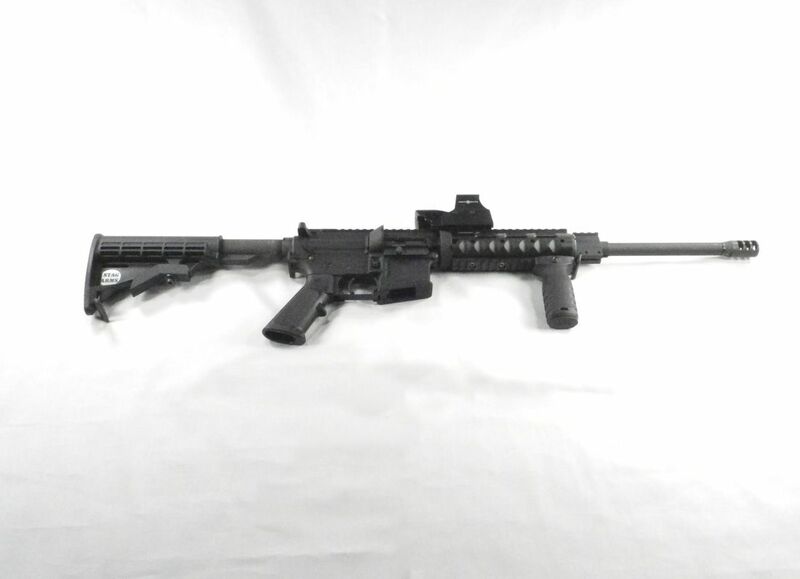 Since we like Stag Arms products when we looked at 5.56 ARs we decided to purchase the Stage Arms Model 3. This semi-automatic 5.56mm NATO firearm (that will also shoot .223 caliber rounds) has a direct impingement design, measures 32.5" (collapsed) or 35.75" (with the Mil-spec 6 position stock fully extended or pinned for legal reasons) and weighs 6.1 lbs. The upper receiver is made from forged mil-spec 7075 T6 aluminum with type 3 hard coat anodizing and has a Picatinny rail on top. The lower receiver is made from 7075 T6 aluminum with a type 3 hard coat anodizing. The 16" 1/9 rifled barrel is made from 4140 government profile steel that is chrome lined and manganese phosphate coated. The firearm has an enhanced 5.56 semi-auto bolt carrier with a manganese phosphate coating and a standard carbine buffer and spring. It has an A2 style plastic grip, Mil-spec single stage trigger with a non-adjustable 5-8 pound trigger pull (which can be upgraded), a Diamondhead VRS drop in modular handguard and a standard mil-spec charging handle. The front sight is a Picatinny railed gas block and there is no rear sight. Even more so than their other firearms the Model 3 can be significantly upgraded. For example the "plus package" adds a 4150 chrome lined CMV steel barrel, 1/7 Twist rifling, individually Magnetic Particle (MP) and High Pressure (HP) tested and marked bolt & barrel, M-16 Bolt Carrier, and a heavy buffer assembly. 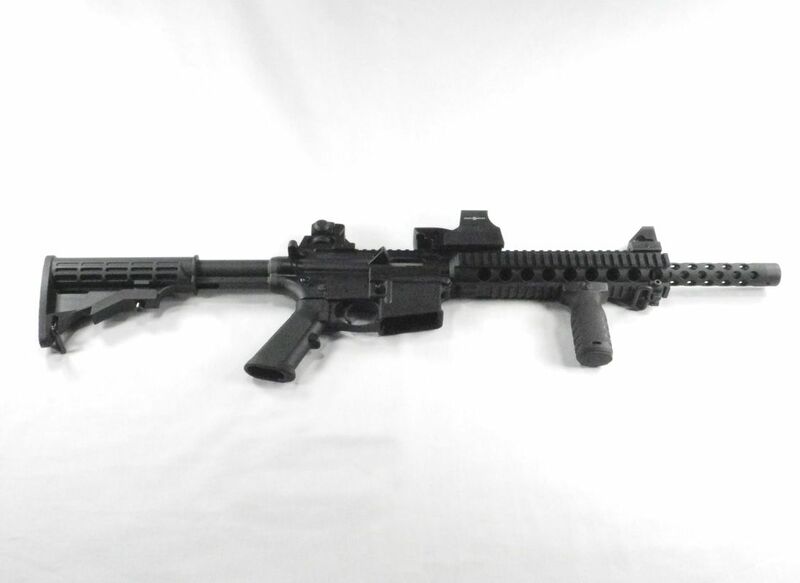 Since this firearm uses magazines that are the same form factor as the standard AR-15/M-16 magazines they are available in 10, 20 and 30 round variants. We use this firearm for shooting at 100+ yards and it is very accurate and reliable. You can buy this rifle at stagarms.com or your local FFL dealer. If you would like to see a detailed YouTube review of the Stag Arms Model 3 - Gun Talk Media has a good one here. The forerunner of all AR platform rifles is the Colt (Armalite) M-16 and its civilian derivative the AR-15. Since these are such iconic firearms I have one in my collection. But when I looked for one I wanted one that would match my Stag Model 3 with its capabilities to fire 5.56mm 62 grain rounds – not just .223 caliber or 55 grain rounds. After a fair amount of searching I found what I was looking for; a Colt Sporter II Model R6550; a model that has one of the closest configurations to what the US military M-16 had. The R6550 has the following characteristics: 20" barrel with 1 in 7 twist, A2 flash hider, fixed carry handle, Colt raised front sight and a Colt flip-up rear sight that is adjustable for windage and elevation out to 800 yards with no tools needed, ribbed cylindrical hand guard, forward bolt assist, case deflector, bayonet lug and a hinged ejection port cover. 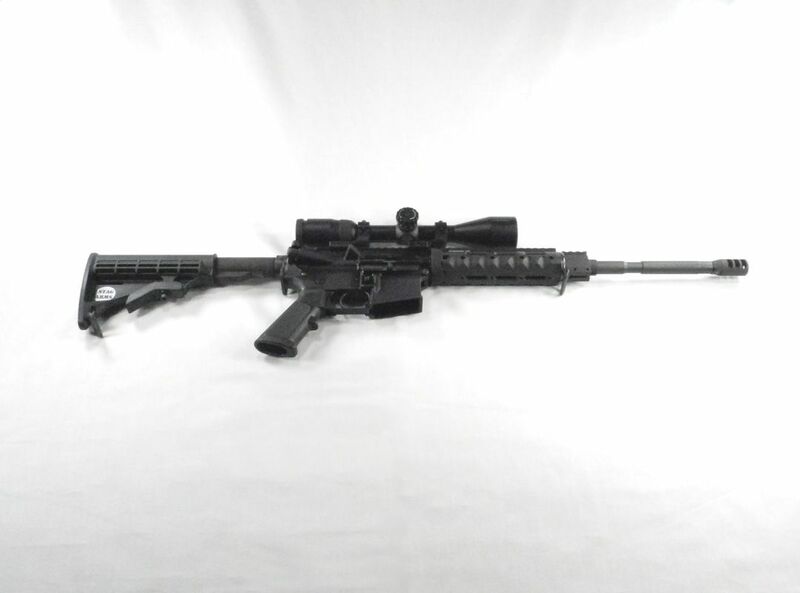 You might be able to buy this AR-15 at your local FFL dealer, if not you will probably need to go to gunbroker.com to find a previously owned one that someone else is selling. If you would like to see a detailed YouTube review of the Colt R6550 A2 Sporter II - TalkIsCheap NM has a short one here, and Mountaineer 304 has an up close review of a Colt AR-15 A2 Government Model HBAR here. While the M-16 was the weapon of choice for the Western countries from the 1960’s through the 1990’s, the weapon of choice for the Eastern Bloc and other Communist or non-aligned countries was the AK-47. Since the AK-47 is such an iconic firearm I decided that I wanted to add one to my collection. But I had a problem – I don’t really like firearms with wood stocks – and that’s exactly what most AK-47’s have to keep their production costs low and to allow them to be produced with less sophisticated machining than Western firearms. To complicate matters further, since I live in an anti-gun state that kept the 1994 Assault Weapons Ban in place after it expired, I also had to find a firearm that was made before 1994. Luckily there were lots of variants to look at since, even after 70 years, the AK-47 is the most popular and widely used assault rifle in the world because of their reliability under harsh conditions, low production costs, ease of use and the fact that the AK-47 has been made by over 30 different countries (from Albania to Yugoslavia). After a considerable amount of research I came across the Norinco MAK-90, a civilian version of the Chinese Type 56 assault rifle that started production in 1956 and was based on the AK-47. The MAK-90 nomenclature stands for “Modified AK-1990”. Following the 1989 import ban (which banned the MAK-90 because of its pistol grip, folding stock, threaded muzzle and bayonet), the Chinese developed an AK which met the "sporting purposes" clause. Although the majority of MAK-90’s have wooden stocks and fore grips like most AK’s, in 1993 and 1994 there was a variant that had lightweight black synthetic skeletonized Choate hardware – which today has gained popularity as the “Dragunov Stock”. 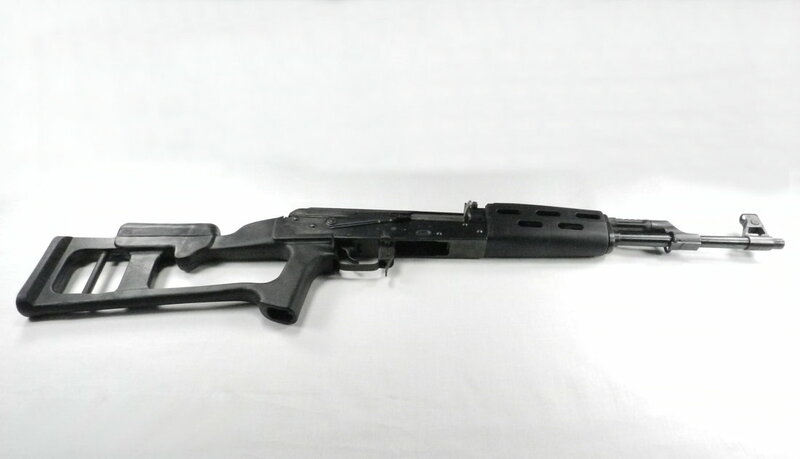 The Norinco MAK-90 has the following characteristics: fires 7.62 x 39mm rounds, is 35.1 inches long, with a chrome-lined barrel that’s 16.34 inches in length, weighs approximately 8 lbs with an empty magazine, has a fully enclosed hooded front sight protector with a hole in the top and a smooth receiver cover. One advantage that the MAK-90 has over most AK-47s is that the thickness of the receiver's metal is 1.6mm instead of the 1mm that most AK's have. Additionally, the fit and finish on the MAK-90 is comparatively good and the trigger pull is smoother than most other AK’s produced in other countries. You might be able to buy a MAK-90 at your local FFL dealer since they show up every once in a while, if not you will probably need to go to gunbroker.com to find a previously owned one that someone else is selling. If you would like to see some detailed YouTube reviews of the Norinco MAK-90 - Max Headspace9mm has a good video here and mixup98 has another one here.